The Sandwich Plate System (SPS), invented and patented by IE, has been used in a variety of ship repairs over the past year. SPS comprises a composite material with two metal outer plates and a solid elastomer core, whilst SPS Overlay is the process by which original structures are reinstated with SPS. The existing worn structure is retained and reinforced with a new steel layer and polyurethane core resulting in a strong, flatter surface, and is a process that IE claims offers much reduced repair times, and superior performance characteristics to conventional stiffened steel. The offshore vessel segment has proved to be a particularly receptive market with a number of significant projects carried out during 2018. One involved an FSO, which had 72m2 of its side shell reinstated using SPS while on station offshore Australia during a six-week period in June and July last year. The repair to this ABS-classed vessel was undertaken by SPS licensee Asian Sealand Offshore & Marine (ASOM) and the project comprised the reinstatement of the side shell and longitudinal bulkhead plating for the starboard slop tank. This was the second SPS project onboard this FSO, which remained fully operational during the repair, the first having been the reinstatement of accommodation deck plating in May 2014. According to IE, the use of SPS enabled the repair to be completed without the use of cofferdam and divers, thereby reducing the safety risk, the time required for the repair and also the cost quite significantly. The SPS low heat input solution was utilised for this application to avoid direct welding to the affected side shell plating that was underwater. Work was also completed last year to a Russian offshore supply vessel, whose decks were reinstated whilst in Tallinn Shipyard, Estonia, using SPS. Technology licensee, SRC, injected a total of 88 cavities, covering a total area of approximately 647m2, onboard this vessel, which is owned by JSC Arctic Marine Engineering Geological Expeditions. More recently another SPS licensee, Marine Offshore Management (MOM), used the system to protect the hull of the Pompei, a side stone dumping vessel owned by the Jan de Nul Group. As the vessel operates in shallow water, the vulnerable bilge area needed to be protected against large, sharp and potentially damaging boulders on the seabed. 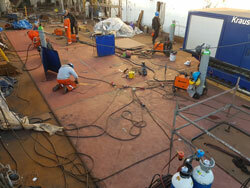 The work was undertaken in Yalova, Turkey, by MOM working together with a local shipyard. A total of 131m² of the hull was reinforced using SPS and the project took just 14 days to complete. While the offshore market has been one of the most successful for IE’s SPS system of late, other projects in different maritime markets demonstrate its versatility. For instance, P&O Ferries’ European Seaways had 320m2 of deck reinstated while at Poland’s Remontowa Shipyard, Gdansk, taking the number of P&O vessels to have used the repair technique to 30. SRC last year used SPS to reinstate deck 14 of the cruise ship Sun Princess while at Sembawang Shipyard, Singapore. In this case the repair covered a total area of approximately 61.9m2 on the port and starboard side of the deck. Another cruise ship project was completed, this time for Carnival UK, last September when 48m2 of permanent reinforcement was undertaken while the vessel was in Southampton. SRC undertook all the steelwork preparation and installation for the project. Working in a height restricted area, its team created 14 cavities into which the SPS elastomer core was injected to fully reinstate the strength and integrity of the structure.